I’ve had limited opportunity to try some of the mirrorless hybrids on the market (although have high hopes for something a bit more robust from Sony in the NEX line), so I tried something new on a recent vacation, carrying around a relatively compact (and thus relatively entry-level) DSLR. After reading pretty positive reviews on the Pentax K-x (which has been on the market for a while), the company was kind enough to loan me one for my experiment with the default 18-55mm kit lens and and a telephoto 55-300mm zoom. The K-x has image stabilization built into its body. 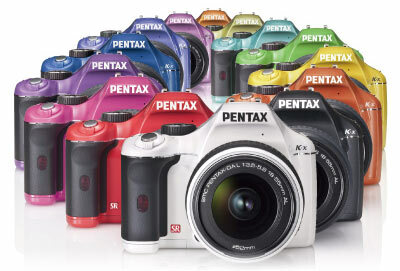 Pentax offers the K-x in a puzzling variety of colors and I was game to to try about any Skittles shade they would offer. The result was a white body with black trim, leading to one Force-ful comment that it was “the Stormtrooper’s camera” (although, were that true, the camera would invariably get shot before it could shoot). I loaded it and the long zoom lens into an old but compact blue LowePro bag that’s nearly as cheesy, and put that inside a carry-on backpack. The point-and-shoot I usually carry is a pretty respectable Canon S90, but there’s just no comparison. The K-x was fast and effortless in nearly all settings, often snapping great shots one-handed while barely slowing from my pace, produced some close-ups with some nice bokeh effects, and did a great job at ISO 1600 on some night street scenes. Having previously shot with entry-level and midrange Nikon DSLRs, I like the way Pentax has implemented access to most controls in more of a point-and-shoot style, although its multi-tabbed settings can be a bit daunting. The HDR feature is pretty cool, too. The K-x did hit its limits inside a dark restaurant without the flash, and there were a few times when the autofocus couldn’t lock. In all but two or three cases (out of a total of well over 400 photos shot over the course of the trip), I resolved this by stepping back or picking a different autofocus point. The camera also struggled to autofocus in LiveView. Impressively, though (compared to other low-end DSLRs I’ve used), it never autofocused on the wrong thing (although maybe I’m just becoming a better photographer). Alas, while I tried to bring the K-x everywhere, there were a few instances such as breakfast in the hotel where the bag just seemed too much to drag around and I didn’t want to have even its relatively light weight around my neck, so I my point-and-shoot still saw a little action. For any future family vacations, though, I’m definitely making room on my carry-on to bring a camera with a nice big sensor. The results are worth it.